Beltrame Wealth Management is a financial planning and management firm. The site uses a fairly simple design. The homepage is dominated by a photo slideshow, with short text snippets on each photo directing users to a separate part of the site. 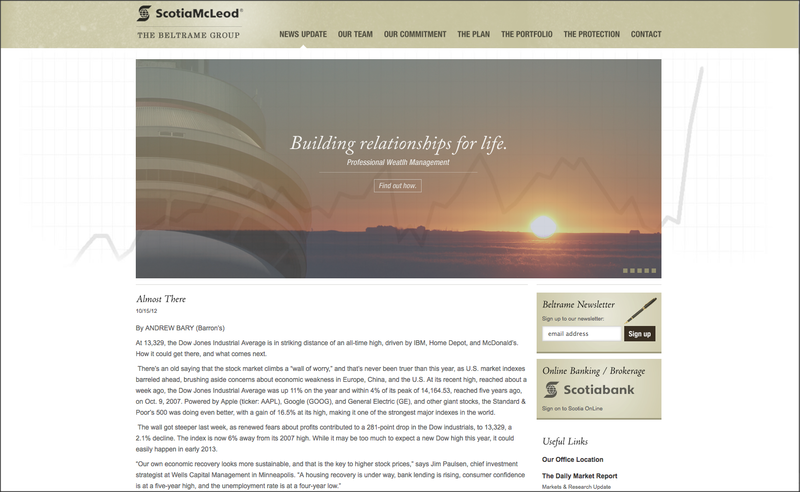 Above the slideshow is a header with navigation and the company logo. Below the slideshow the home page uses WordPress’ blogging software to give updated financial information. Other site pages show the same slideshow above the text on the page. The site is aiming for high-income users, and the audience probably skews much older than the average internet user. Provide information about investing, and to present the company as stable and committed to its customers, to entice people to invest with the company. The site also presents updates on financial news, giving new and existing customers the impression they quickly respond to changes. Other than allowing users to sign up for an email newsletter, there are no links to social media or sharing options on the site. The site uses WordPress as a platform. According to the WordPress.org showcase, Beltrame’s site uses WordPress as a CMS along with custom fonts.